10T Web Design is very happy to announce the relaunch of the Belmont County Recorder Office’s website. 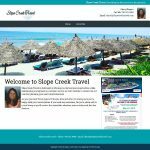 The site features a custom designed, fully responsive theme. It also has a CSS only slide show that displays correctly, even on mobile devices, not to mention links to the updated online deed lookup through the US Land Record’s website. So, what are you waiting for? Head over and check it out now! It never fails; when I tell people that my computer is filled with software that can be downloaded from the Internet, they assume that it’s all stolen. Then the open source software discussion begins. I reassure them that, in fact, it is 100% legal and that people give their software away for free all the time. I tell them that, yes, I am serious. I explain that it is, in fact, very high quality, secure and, yes, legal. When all else fails, I tell them that, chances are, their web server is running open source software now; occasionally, they ask me if they should upgrade their web server. If you didn’t know that there is software out there that you can use legally, free, you are not alone. And if you think that you’re not technologically savvy enough to use it, you are most likely wrong. We’re going to take a look at some open source alternatives with a series of posts spotlighting just a few of the ones that I use. Today’s entry: Firefox Web Browser. Firefox is probably one of the best known pieces of open source software around, so you may have already heard of it. Firefox is the second most used browser out there. It’s been around for a long time (its first release was way back in the Bronze Age of the Internet… 2002), and actually grew out of the old web browser Netscape Navigator, which was first released in 1994. If we consider that the true birthday, it pre-dates Internet Explorer by almost a year. So, with almost three times as many people using Internet Explorer, why should you make the move to Firefox? It’s more secure. Security bugs are fixed in a matter of days, compared to weeks or sometimes months for Internet Explorer. Another security advantage is that anyone can look at the code of Firefox, so it is easier to discover security issues. It runs on basically everything. Windows, Mac, Linux, Android, iPhone/iPod/iPad. Pretty much you name it. It comes in a crazy number of languages. Currently over 80. Even Esperanto. If you are ready to give it a try, you can download Firefox from their website. Give it a try, and let me know what you think. For someone who makes a living helping companies and non-profit organizations build their small corner of the Internet, I spend a good bit of time thinking about people who don’t have access to the Internet. In the United States, we often take access for granted. Our cell phones have access, our laptops have access, even our iPods can use the Internet at most any restaurant or hotel, usually for free. Even for those people who don’t have the means to buy a device, the entire world is at your fingertips at your local library. Let’s face it, we’re pretty connected here; the 81% of our population that uses the Internet makes up the second largest number of users for any country in the world. It is easy to forget that there are countries where Internet access is too expensive (or too dangerous to the established government) to allow for widespread use. A full 72 countries have under 25% of their population using the Internet; that’s more than a third of this list. The sad part is, that’s not even an exhaustive list, as North Korea, a country of 24.5 million people only known to own 1,278 heavily censored IP addresses, is noticeably absent. Even if each of those IP address gives access to 100 citizens, which I’m sure it doesn’t, that’s still only ½ of one percent of the population. Globally, there simply isn’t enough people being able to find out what’s really going on in the world, take free on-line educational courses, or do the really important things, like look up cute pictures of cats wanting cheeseburgers. So, how to you get all those crazy cats (and news and educational resources, too) delivered to those who can’t afford to, or are not allowed to, access it? You give it away for free from space, of course. At least, that’s what a newly formed non-profit Outernet plans to do. Their initial plan is to launch a set of low-orbit satellites that will broadcast a loop of information including local and international news, crop prices, online courses, all of Wikipedia, and emergency notifications. Long term, they want to turn the satellites into a full, free, two-way, global way to get access to the Internet, so everyone can enjoy all the cute cat pictures they can stand. Their engineer has two of the three coolest names ever. It is the most confusing question for a client about web design, but ultimately one that everyone considering a website will eventually ask. I’ll let you in on a little secret, though: It’s a confusing question for web designers, too. There isn’t just one type of website. I like to compare the question above to “How much does a car cost?” Websites come in all shapes, sizes, and levels of functionality. Simple, small, informational websites will naturally cost less than a new implementation of Facebook; more complex equals more expensive. Quotes can vary greatly between designers. Ask three different web designers, and you are likely to get three (possibly drastically different) quotes. It might have to do with how comfortable the designer is fulfilling the goals you have for your website, or simply how busy the designer is. Is the quote per hour, or for the entire project? Depending on the designer, they might give you a quote based on the entire project, or an hourly rate until the project is complete. While you might not flinch at paying a website designer $100 per hour, without knowing how many hours it takes to design a website, that number is really meaningless. I know what you’re saying: You still haven’t told me how much a website costs. I’m getting there, I promise. Now that we have some general topics under our belts, let’s consider different options that you might want incorporated into your website. Whenever you are looking to have someone design you a website, these are usually some of the first things they consider before giving you a quote. Who is going to manage the email? Just like with the domain name and hosting, if you want to have email added to your package, there will be more charge. If you are the only person in the business, this is one you can probably tackle on your own. If you have hundreds of employees that need to be set up, it might be best to leave it to the designer. What do you want your website to be? You might just want a five-page informational site that will only need updated every year. You might want the next Google. Technically, both qualify as websites, but the former can be completed over the course of a week, while the latter takes a team of designers working full-time just to stay ahead of the competition. Each page you add, each custom-built form or application, each anything you add, the longer it will take, and the more the price goes up. Who is going to provide the website’s content? A beautiful website won’t get you anything if there isn’t information on it. Providing the web designer with the website’s content will lower the price, while asking the designer to provide the copy will make the cost go up. Even more complicated are the images for the website. Providing your own images to the designer is the cheapest option, but depending on the quality, might not look as good on your website. Most designers will capture or create images for you, or can provide stock photography, but it usually starts around $3 to $5 even for the cheapest images. Does the site come optimized for search engine indexing? Search Engine Optimization, or SEO, is something that’s pretty easy to define, but can be tricky to understand; simply, it’s making the website look attractive to web crawlers owned by search engines like Google and Bing. All sorts of things go into SEO, so it’s usually best left to a web designer. Money spent on SEO is usually money that doesn’t have to be spent later on pay-per-click marketing. What type of maintenance comes with the design? Most all websites need periodic maintenance, be it updating information, adding new content, or (worst case scenario) recovering from a defacing or some other type of security intrusion. It’s important for you to know what all you are getting with the deal, as hourly maintenance cost can grow quickly, and recovering from an attack can cost be even more costly. How will the website’s content be managed? Once the maintenance agreement runs out, how easily can you make simple updates to the website’s content? If there is no Content Management System (CMS) in place, it makes it less expensive, but more challenging to update. With a CMS in place, most anyone can make routine changes to the website’s content. Will the website be marketed, and how will the site’s usage be tracked? Do you want there to be some sort of pay-per-click marketing, email marketing, social network marketing, and if so, how much of each? You can spend about as much as you want advertising online, but having the designer do it for you will result it at least a small markup. And without some sort of tracking mechanism, you’ll have no way of knowing how successful your website is. While most designers will install some sort of tracking for every website they design, but it’s still good to ask. OK. How Much Does it Cost, Already? I know. We’re almost 1,000 words into an article about how much a website costs, and I haven’t given you a figure yet, but the wait is almost over. It’s important to have some sort of basis before I start spitting numbers out at you. So, in general, here are some rough estimates of how much a variety of websites would cost. 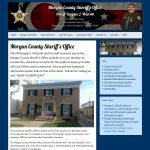 So, this would be your basic, informational only, five to seven page website. As mentioned before, who is managing the domain name, hosting, and email will cause the price to alter. Expect the design to be either relatively simple, or a template that may be used for other clients. The content would be almost completely provided by you, although a few stock images would usually be included. There wouldn’t be much in the way of long-term maintenance, probably little or no search engine optimization, and no content management system. There will be no marketing done by the designer, but they will usually install some sort of usage tracking. The biggest difference between this price range and the basic price range is design. At this price level, you should expect a design that has been created just for you and your business; the more intricate the design, the higher the cost. Expect the designer to set up the domain name, hosting, and email for you, and expect them to allow you to have more pages, most likely up to the range of 20 or so. Again, the text content will mostly be provided by you, but the designer may be willing to provide some copy on the upper end of the price range; you should expect the designer to provide any stock images that they need for a complete design. There will still probably not be much long-term maintenance, but you should expect somewhere in the range of three to six months. There will be no content management system or marketing, but you should expect the website to be search engine optimized. Speaking honestly, this should really be the price range that most businesses should be in. You’re still going to get a non-template, custom designed layout, with most of the price difference again coming from the intricacy of the design. The rest of the price difference comes from if you want a custom-built CMS, which will drive the price up; most people will be more than satisfied with an out of the box CMS like WordPress. Your going to get everything from the custom designed website from above, but the maintenance term will usually be longer for routine updates, because a CMS makes updates simpler. Page restrictions are usually relaxed even more, due to the CMS making them easier to produce. Best of all, a well designed CMS will allow you to make routine changes yourself even after the maintenance agreement ends, should you choose to, or make the cost of long-term maintenance cheaper. Content management systems also allow you to ‘blog,’ or post news updates, and most any designer will integrate these to your social networking sites, such as Facebook or Twitter, as well. If you are looking for e-commerce, custom designed application builds, or intricate programming, expect to be in this price range. Simple e-commerce can usually be done for the starting point, but larger, enterprise type shopping sites can easily grow to a cost of several hundreds of thousands of dollars. Expect at least a year, and possibly multiple years, of maintenance to be included. Also, expect the designer to take care of all hosting and domain requirements. While not always included, this will often come with some sort of marketing plan, as well. So, there you go. That’s a rough outline of how much a website costs. As you can see, it can be a challenging question to answer. If you would like an estimate on a project, feel free to contact us and we can give you better estimate. 10T Web Design is happy to announce the relaunch of the James Carnes Center Website. The new website features a calendar of events, making it easy to find out if the Carnes Center is available for your event. Why not head over there now and check it out? 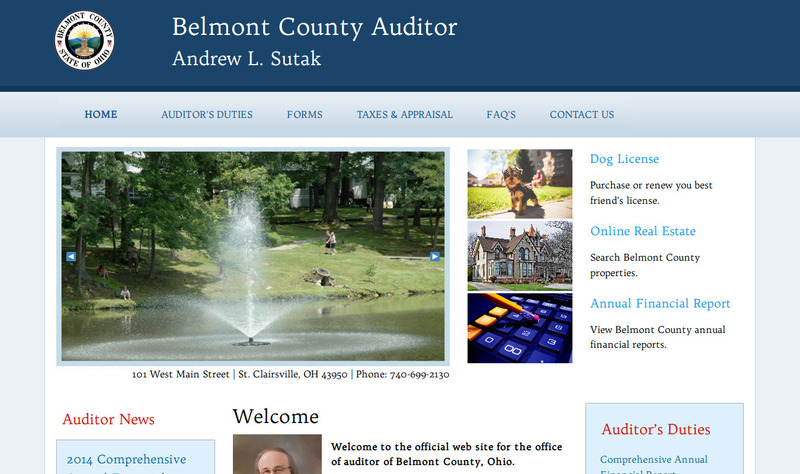 10T Web Design is happy to announce the relaunch of the Belmont County Auditor’s website. 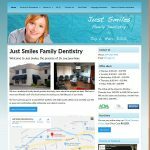 While 10T Web Designs has been maintaining their website for a few months, we have now completed the transitions to new the new design. 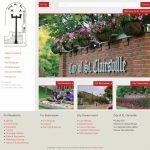 The layout is a reworking of its previous design, updated to more modern web design techniques. For the Auditor’s website, the font was modernized and enlarged for easier viewing. 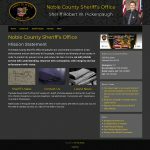 The front page’s Flash slide show has been replaced with a pure CSS slide show, eliminating the user’s need to have Flash installed and the security risks that come with a Flash installation. The Auditor’s News is now presented in an RSS feed, allowing users to subscribe with a news reader or by signing up to receive the Auditor’s news by email. 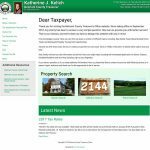 The Auditor’s website can be found at belmontcountyauditor.org. Head on over and check them out! Had a great afternoon and evening yesterday at the 2013 Belmont County Fair Livestock Auction. We bid on several animals and bought a goat from Allison McIntire. Thank you, Allison, for all the hard work you put into your goat project this year, and also thank you for the gift package, especially the candy buckeyes, which I’m enjoying right now. It really was awesome seeing so many local businesses out at the fair supporting the youth of Belmont County. It’s no wonder that this is one of our favorite days of the entire year. In general, the shorter you can make your domain name, the better. It makes it easier for your visitors to remember and it’s easier to type. So, if your business is named Super-Super Widgets Service and Custom Installation, instead of supersuperwidgetsserviceandcustominstallation.com, try to get supersuperwidgets.com or, even better, supersuper.com. The less you make your visitors type, the better. Try to get a .com. It’s not always possible, but if given the choice, pick the .com variant instead of other top-level domains like .us or .net. I know supersuper.info is a few bucks cheaper than supersuper.com. You’re going to be selling thousands of widgets, so what’s the big deal about spending less than the cost of lunch over the course of a year for the better domain name? People are so used to hearing .com that even if you tell them supersuper.info, they still hear supersuper.com. Ok, maybe you don’t have to fear it, but you should be leery of the hyphen. Only use it if there is really no other option. I know the company is named “Super-Super Widgets” but people are going to leave they hyphen out. Not to mention that if you register super-super.com and a competitor notices that supersuper.com is available, they will register it, they will direct it to their website, and they will get visitors who are trying to find you. Worst of all, there really isn’t much you can do about it, short of a possible law suit. Does it look good on a billboard? You want a domain name that just ‘looks’ good. If it’s all gnarly and hard to remember, people are not going to remember it. As it turns out, super.com might be up for auction, but it’s going to cost you a couple hundred (or possibly thousand) dollars to buy. Why? Because super.com would look awesome on a billboard. You have to use your judgement and decide if the extra investment is right for you, but you have to admit, getting super.com would be pretty cool. Maybe super.com is out of your price range, and supersuper.com and any other variant you can think of isn’t available. Try to get a domain name that has some of your business’s keywords built in. Maybe you’ll get lucky and widget.com will be available. If not, maybe superwidgets.com will be. Make it something they will remember. Last, but not least, it needs to be catchy. Most people don’t walk around with a pen and paper to write down domain names they come across, so make sure it’s something that will stick in their mind. Wanted to take a moment to wish a ‘Happy Birthday’ to Sir Timothy John “Tim” Berners-Lee, the inventor of the World Wide Web, which was born with the first communication between a ‘web browser’ and a ‘web server’ in mid-November of 1989. Sir Berners-Lee is also a director of the World Wide Web Consortium, the founder of the World Wide Web Foundation, a senior researcher at the Computer Science and Artificial Intelligence Laboratory at MIT, and, naturally, a knight. Everything on the web today, and everything we do here at 10T Web Design, builds on the Hypertext Transfer Protocol designed by Sir Tim Berners-Lee over two decades ago. Thank you, Sir Berners-Lee, for getting this crazy thing we call the web going, and have a very happy birthday! Most people are not taking advantage of Google+ for their business, as many people have been slow to using Google+. It is, however, continuing to gain traction in the social networking world. If you are interested in improving your business’s Google+ page, Small Business Trends has a nice article to help you improve your profile.